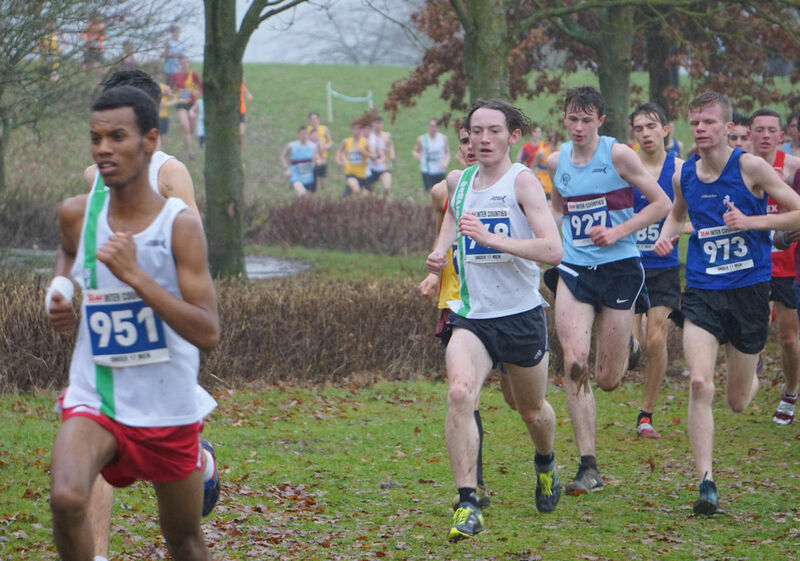 Comments, posts and images from Club Cross Country events. First time that Queen Elizabeth park has hosted a Hampshire League event, and what a course. 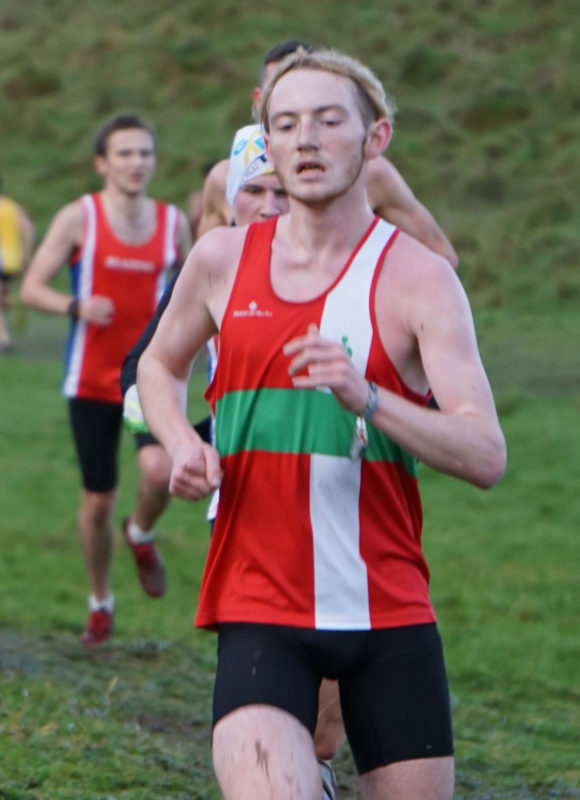 Robbie stepping up to run in the Under 20’s for the first time finds himself racing a long 10k event, 3 laps that include one hell of a hill. 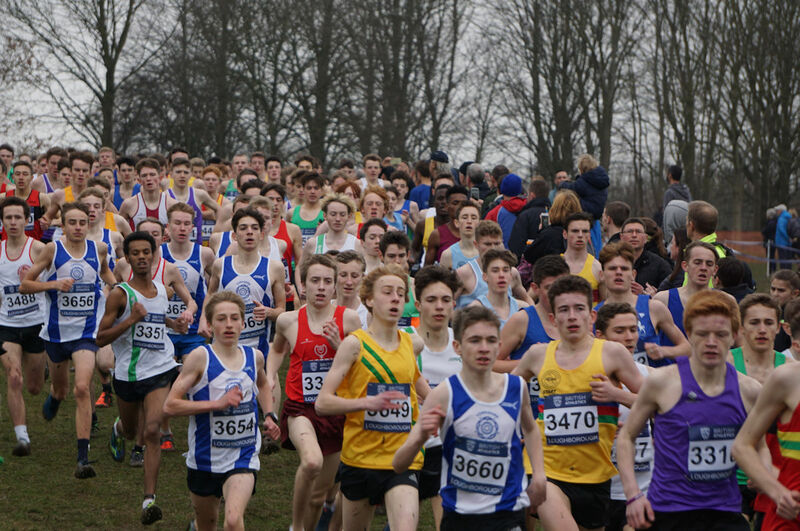 A good start in an impressively attended race (286 competitiors completed the race). First down hill saw Johnny Hay leading the way and a substantial amount of AFD vests in the leading 10 runners with the Senior Men’s event being won by Matthew Sharp of Team Spy, but closely followed by Dane Bloomquist, then Johnny. The first 10 finished included 6 AFD runners, one of which (Luke Prior) was racing in, and won the Under 20’s. Robbie came 25th overall, 5th in the U20’s behind Luke Prior (AFD), James Heneghan (Winchester), Jake Cvetkovic (AFD) and Dominic Willmore (Poole Runners) and completed the tough 10k course in 37:34. 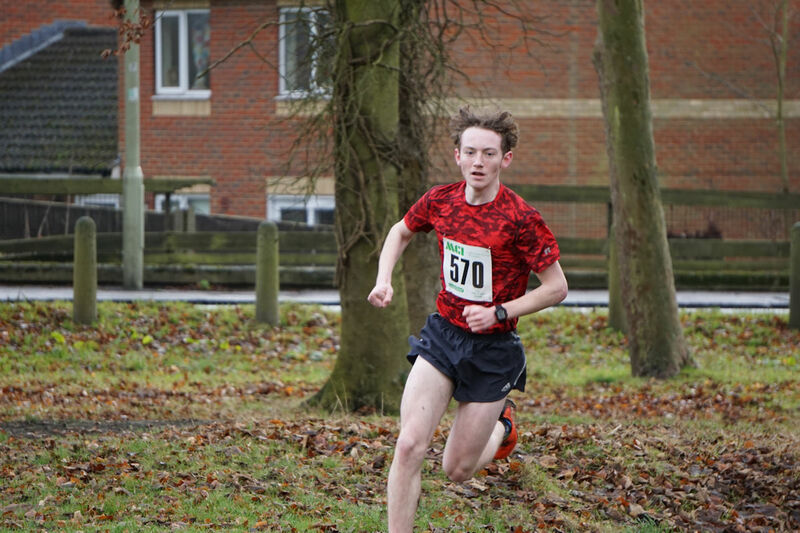 Great run, especially after his 7.0k race in the AOC southern championships on Friday where he finished 3rd representing Farnborough 6th Form College. Well, it took the National Relays to get Robbie back on the cross country circuit, running for the first time in an under 20 race. Robbie was given the role of anchor, bringing in the AFD Junior Mens B team, a good run in general, though over 30 seconds slower than last year, a combination of conditions and running the last rather than the first leg. It’s a start though, now time to concentrate on the leagues, and to work toward the championships in early 2018. A long almost single loop course for the U17’s a good solid 6km with some very sticky mud covering the entire width of the course in places. Robbie had another disappointing performance this week, seems to be a standard at all the major events this year finishing way back in 39th place and not scoring for Hampshire team, so despite Hampshire coming 2nd, Robbie did not qualify for a team medal. 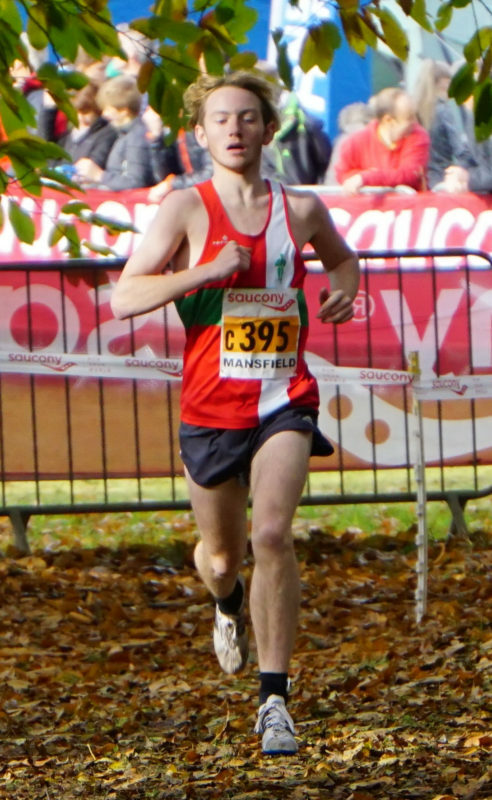 Overall one of his worst performances on the cross country circuit, with no real rhyme or reason behind it, obviously he is quite annoyed with his performance, and a talk and planning session with coach Mick Woods needs to be on the cards to give advice and direction for the future. 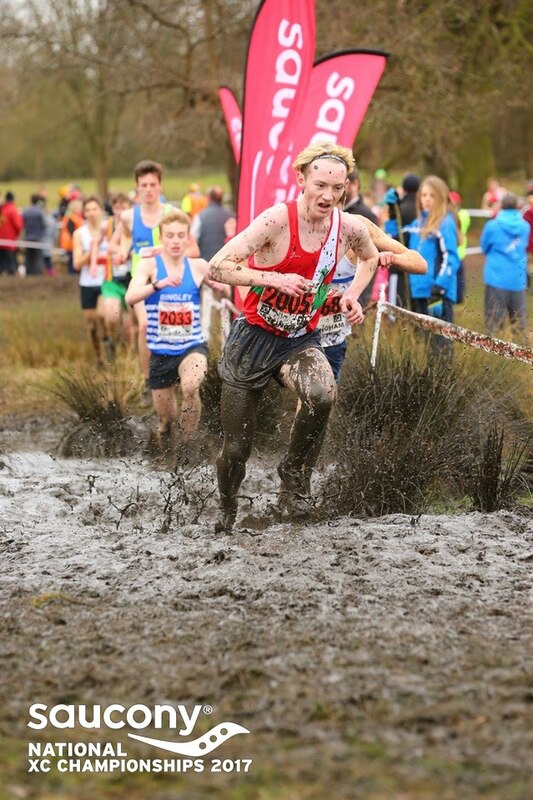 With only one event left, the English Schools Cross Country Championships coming up on Saturday, a little less expectation sits on his shoulders due to his bottom year status in the schools events. The plan is to go out and maybe try something a little different, play around with the tactics a little and see if we can find something that works. A great day out for Hampshire as a whole though with Zac Mahamed winning the race and Lachlan Wellington taking Individual Bronze, despite these 2 great individual performances Hampshire were still pipped in to 2nd place in the team event by a very strong Yorkshire team. After a bit of re-arranging due to traveller interference the Reading leg of the Hampshire League was held on Saturday March 4th. With the tweaks and changes this became the final event of the league, so timings were altered slightly to take in to account the medals ceremonies, in which AFD were rather prominant. On the day we had some great performance from both teams and individuals, doing well in the female events with the first three scorers finishing 1,2 and 6 in the Senior womens, 2, 6 and 9 in the U13 girls, but unusually for AFD showing prominence in the male races with the scoring 3 finishing 1, 6, 12 in the Senior men, 8, 11, 12 in the Veteran men, 1, 2, 3 in the U17 men, 2, 3, 4 in the U15 boys and 1, 2, 4 in the U13 boys. All of which aided greatly in the overall results with AFD taking away the following medals from the Hampshire League 2016/17 season. 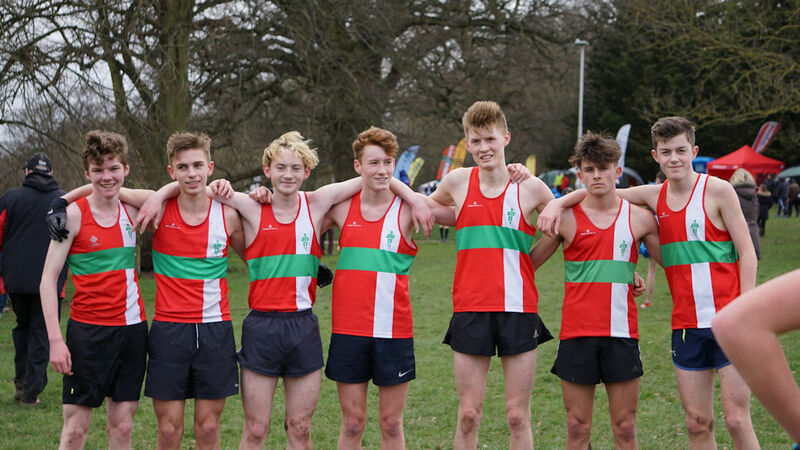 Well done to everyone who competed over the entire season, some great runs, a very fast one in the U17’s at Reading with Robbie competing the (claimed) 6km course in 17:19 with 6 AFD runners in the top 7 all finishing in under 18:30. Congratulations to the top 10 boys who ran a very fast, very aggressive race in some quite difficult conditions. A very “Cross Country” course at Wollaton Park in Nottingham greeted the hordes of runners turning up for the National XC Championships. Robbie’s U17m race due to commence at 12:35 gave us plenty of time to walk the course and investigate the swamps. The course had plenty of diversity, some good hills, some smooth good going, some heavy going and some very boggy areas made a good mix. Target was top 20, with a push target for top 10 but alas it wasn’t to be, a week away from college, a birthday and a couple of birthday celebrations took their toll on Robbie who simply didn’t have the legs on the day ultimately finishing 34th in 21:48, not a totally bad result, but not where we wanted to be. 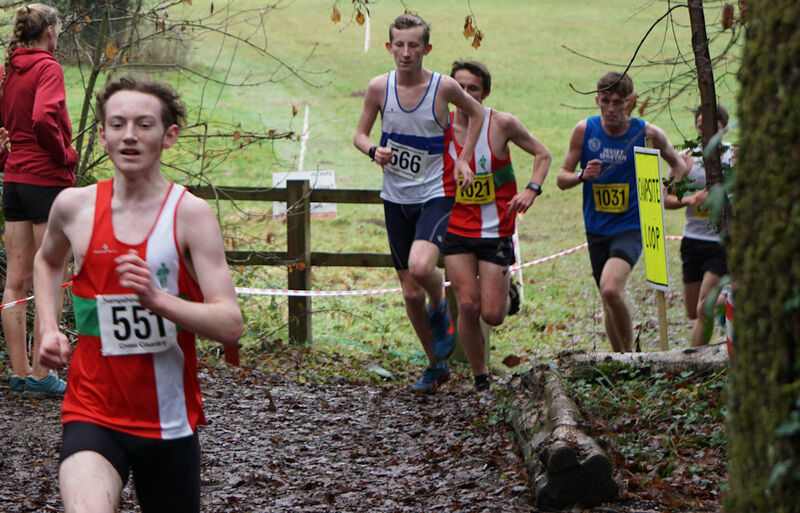 Time to get his head back in the game with the last Hampshire League this coming weekend, and Inter-Counties and English School just around the corner, preperation is everything now. 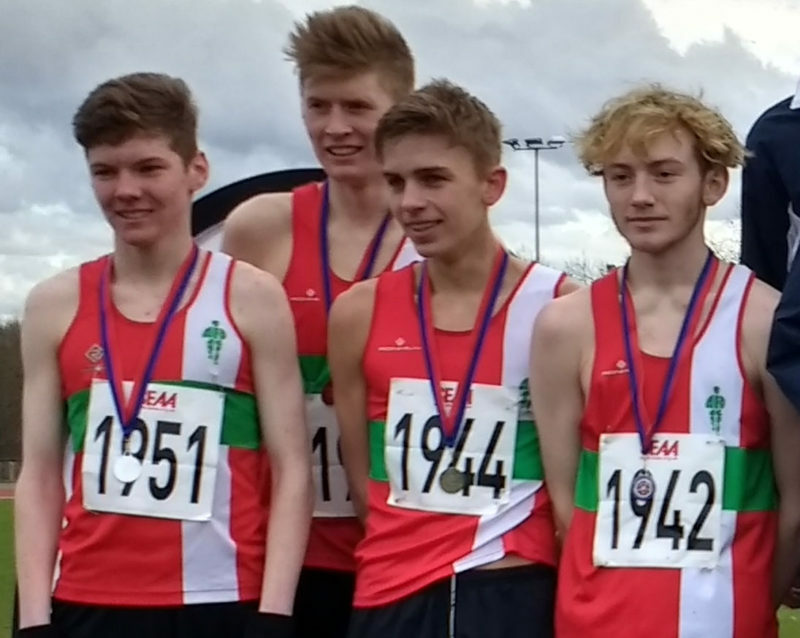 The silver lining from the day is that AFD had another great spread of team results, out of ten team races winning 4 golds, 2 silvers and a bronze, one of those silvers being from the U17m’s race, so Robbie managed to walk away with a Silver medal on the day. With half term hitting on many of the participating Counties the younger races were a little light on numbers this week, but AFD came on mass to up the stakes and had a great club day out. So a great day for boosting the League positions across the board. Robbie had a great run in the U17’s with the previous league leader (Lachlan Wellington) missing a second race and dropping out of contention the race was still going to be hard with current 2nd place Zac Mahamed, and 3rd place Jacob O’Hara still running. The strong AFD squad looked keen from the start and by the end of the 1st lap, of the 3 lap race, a break away group had formed comprising of Zac, Jacob, Robbie and the AFD possie, Max Heyden, Marcus Shantry, Ollie Percival and Lewis Reid. Coming over the top of the hill and Robbie decided to push the pace a little, taking the others a little by surprise it wasn’t long before a gap began to form, and before the hill was reached for a 2nd time Zac had pulled out, leaving Robbie clear at the front, chased by Jacob, in turn chased by the rest of the AFD boys. Well done to everyone who ran through the snow, over the cobbles and battled the chaos. A really good day out for AFD. For the first time since Robbie started running I missed the Southerns, but Robbie didn’t, with Anna and I celebrating our friends birthday in France both the Southern XC and the Southern Inter-County Schools would pass without our presence. Robbie headed in to London with Anna’s Mum and Dad with hopes of a high finish, targeting top 5 which seemed possible given current form. Unfortunately on the day, things simply didn’t go to plan. A strong start saw Robbie running half the race just inside the top 10, a great place to build from, but a quick trip in to face plant heaven left him feeling a little dispondent when he regained his feet, and despite pushing hard the fire was gone and he ultimately finished in 17th place (in 20.16) . All in all it was a good run, it wasn’t a reflection of his current form but 17th at Parliament Hill is still a great placing. Robbie was 2nd AFD runner on the day, the 1st runner in for AFD was Marcus Shantry (20.03) having a great run and coming 8th, Lewis Reid was AFD’s 3rd runner coming in 20th (20.25) just in front of our 4th and final scorer Max Heyden in 22nd (20.27). Unsurprisingly, on current performance Zac Mahamed (19.01) and Lachlan Wellington (19.02) took 1st and 2nd place with a photo finish required to choose the winner, which was after deliberation handed to Zac, but what a battle for the finish line, both runners finishing 20 seconds in front of 3rd place George Groom. As often happens at the Southerns, Tonbridge had the breadth of field to take the team gold (58 points), closely follwed by AFD in silver place (67 points) with Reading (132) just pipping Ipswich (134) to 3rd and bronze. After the ice, frost and frozen grounds of the midweek a soggy and heavy Cross Country route was something of a surprise, but given the almost 24 hours of rain on Friday it shouldn’t have been that much of a surprise. Fairthorne Manor in Botley provides a very changeable course, with the footing and surface varying from compressed stone, through clods of heavy grass all the way to bogs of mud and sand making for a very “Cross Country” cross country course. For the first time 2017 sees the U17 (6300m) and U20 (8700m) races are combined, running the same course up to around the 6000m mark where the U17’s peel of and head for the finish line whilst the U20’s have another 2500m loop to complete. The combined group of boys raced away across the open fields of the “Arena Stage” and with no Arena loop were soon hitting the first wooded area of the course, coming through those woods for the first time saw Robbie sat back in 8th place with Lachlan Wellington leading the combined groups through the woods. Some 700m later with the slightliy lighter footing of the “Golf Course” stage and Robbie had powered to the front of the group and was taking the race on, looking strong and a lot like the Robbie of old. The lead didn’t last for long though with both Lachlan and Zac responding and coming past Robbie as they entered the second wooded area and pushed in the “Cap Site” stage, Robbie’s legs still not 100% and with a heavy Christmas training routine still hanging on his muscles he simply didn’t have the endurance to keep up the pressuer for any serious amount of time, that said it was really good to see him push it and put the effort and determination in while he could. As the boys completed the first full lap and entered the shorter second lap Robbie was clinging on to 3rd place with U20 team mate Jack Boswell and U17 competitor Jacob O’Hara closing the gap, which and passing Robbie. At the end of the seconf lap, the U17’s peeled away, by this time Robbie was in about 7th or 8th place overall, but 4th in the U17’s so as they peeled off the race was led by Lachlan, who had a convincing gap between himself and second place Zac Mahamed, with a similar gap back to Jacob and another similar gap back to Robbie. Though for a tense final 200m it looked like there might be an upset with Zac switching in to full on sprint mode and quickly closing the gap on Lachlan, though never quite getting there and ultimately leaving the placings as they were at the peel off point. A weekened AFD team, alongside very strong team performances from Portsmouth (1st) and Southampton (2nd) saw AFD finish in a dissapointing 5th place behind 4th place Winchester and 3rd place Guernsey, not through a lack of trying though with great performances from Connor Dauven (23rd) and Stephen Lawry (32nd) in a very strong Hampshire field. Jacob chasing Robbie, chasing Zac, chasing Lachlan in to the Camp Site stage. Another day out to Aldershot for another AFD Christmas special event. Another simple but effective and fun event, the AFD runners are paired up in to couples, with the fastest runner being paired with the slowest runner, the next fastes with the next slowest etc. I remember the first time Robbie ran in this event, at 9 years old he was paired with Steph Twell and was completly made up about it, a very real element of hero worship going on there. This year after about 7 years of progression Robbie is in the fast grioup and get’s paired up with a young female athlete “Amy” I think her name was. The format again is simple, and once again it is designed to make the fast runners work for their living instead of coasting along at the front of the groups. The couples form two sets, the fast runners in set one, the slower runners in set two. Set one run 2.7k first lap and hand over to their partner, who runs the second lap and hands back to the set one partner who runs the 3rd lap, finally handing back to their partner to run the 4th lap and finish the race off. The first lap was started at a rapid pace and was very quickly led out by Josh Grace, with Jack Boswell chasing and Robbie chasing Jack, which is much how the first three runners came in, but by the time set one got back out on to the course positions had floated somewhat, Robbie got out in about 10th place, with Jack further back and Josh a long way back, all three had to work very hard to push up the field and all three more determined to keep the known faster runners behind them than anything else, set one runners made up a lot of places but never did catch each other with Robbie coming in 1st out of the three, followed by Jack and then Josh. Some great running, along with the chase mentality, led to their second lap being run substantially faster than their first lap effort. Another great morning had by all, some heroic efforts put in by the younger and newer athletes and a great spectator event, well done to everyone who ran it was once again a great success. Recent events, trying times and a nasty cold came together on Saturday 10th December to smash Robbie for six. A very poor performance with Robbie feeling out of it from the go. 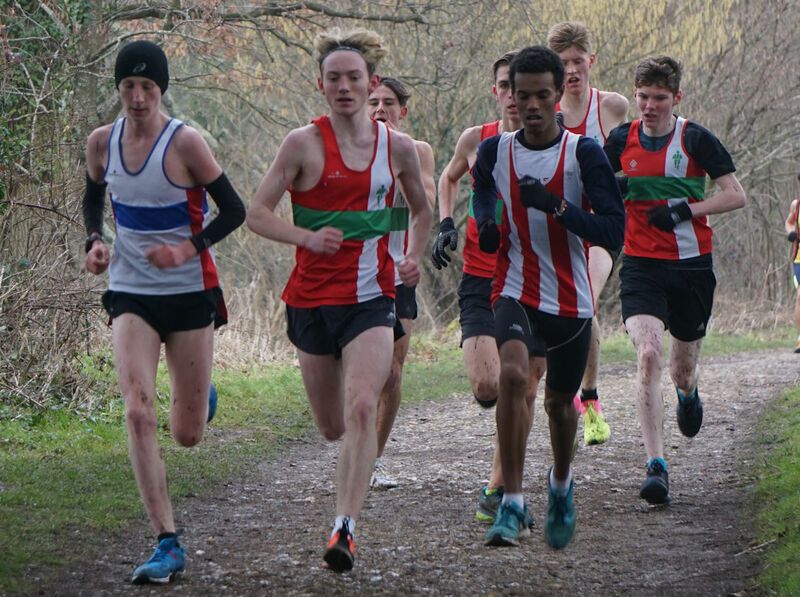 Hampshire battled forward with great performances from Zac Mahamaed (2nd) and Lachlan Wellington (4th) helping Hampshire to the Team Gold, unfortunately Robbie’s 5th place in Hampshire, 28th overall was insufficient to score and dropped him out of the winning team. More work needed to get that fitness up, more determination needed to battle through the little things, but improvement is still on the cards, and 2017 threatens to be a much better year than 2016. No more races now until the new Year, so plenty of time to get back on track in advance of the big races in early 2017. Robbie chasing behind the leading pack about 1500m in. wRECker XC | Powered by Mantra & WordPress.